Cathedral Square: 825 N Jefferson St, Milwaukee, WI 53202, which is downtown across from Cathedral Square Park on the west side of the street, between Elsa’s and Louise’s restaurants. Brookfield Square: 95 N Moorland Rd, Suite FC4, Brookfield, WI 53005, which is in the food court in the southwest side of Brookfield Square Mall. Are both bakery locations the same? Yes! Both our Cathedral Square and Brookfield Square bakeries have their own kitchens and bake from scratch fresh on site every day in small batches, using the same recipes. All of our bakers are trained by our head baker to use the same tried and true methods. Both bakeries can make anything on our website by special order. There are some slight differences in daily offerings between locations based on the tastes of the local communities, but both bakeries offer the same core menu. Can I just walk in and buy cupcakes, or do I have to place an order? You can do either! We always have 25+ flavors in stock, including cake cupcakes and jumbo filled cupcakes. There are 9 flavors we make every day at both locations: Carrot Cake, Confetti, Cookies & Cream, Ghirardelli Chocolate, Lemon, Peanut Butter Delight, Red Velvet, Vanilla, and Vanilla Salted Caramel. Other in stock flavors depend on the season, ingredients we have in stock, and what other customers special order. We often have other fun treats in stock such as cheesecake cupcakes, Ghirardelli milk chocolate chip cookies, cupcake truffles, cupcake mousse parfaits, and cupcake push pops. Selection varies, available while supplies last. Can I walk in and buy a cake, or do I have to place an order? All cakes are custom baked and decorated from scratch to order, and we don’t keep any cakes for sale in our case. We prefer at least 2-3 business days notice for cake orders, but if you need your cake sooner, feel free to call one of our bakery locations and we’ll do our best to accommodate you. Nope! 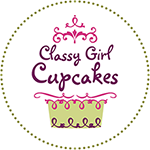 Classy Girl Cupcakes is privately owned by Erica Elia and is based in Milwaukee, Wisconsin. Read more about Erica’s story. What are your bakery hours? Cathedral Square is closed on Sundays, and Brookfield Square is open 11am-6pm on Sundays year round. We do offer catering on Sundays year round. Do you stay open late during festivals in Cathedral Square Park? Yes, we stay open til 9pm on Thursdays or Jazz in the Park from Memorial Day to Labor Day. During Bastille Days in mid-July we stay open til midnight Thursday, Friday, and Saturday, and til 8pm on Sunday. Cathedral Square is closed on major holidays, including Easter, Memorial Day, Independence Day, Labor Day, Thanksgiving, Christmas, and New Years Day. We are open reduced hours on Christmas Eve and New Years Eve as long as they don’t fall on a Sunday. Brookfield Square is open reduced hours on Memorial Day, Independence Day, Labor Day, and New Years Day according to published mall hours. We are closed on Easter, Thanksgiving, and Christmas. Do you make everything on your website every day? No, that would be an amazing feat! Most items on our website are by special order, including cakes, decorated cupcakes, and other treats. Both bakery locations have the same core cupcake menu daily for walk in orders, and will also have other flavors available for purchase depending on the season, ingredients we have on hand, and what other customer special order. Yes, we offer gift cards for purchase in the bakery, or online. Gift cards are available in denominations from $10-$500. They are not currently accepted online as a payment method. Please stop in the bakery to redeem a gift card. Were you on Cupcake Wars? We got several calls from casting and had a professional audition video produced, and then the show stopped filming. Most people don’t realize the show ended in 2013, and they are watching reruns. We wish we could have made it in time! Have any famous people had your cupcakes? Why yes, so glad you asked! :) Check out our Celebrities page, and see us and our cupcakes with Katy Perry, Bon Iver, Taye Diggs, Tim Gunn, Weezer, Andi Dorfman, Lance Bass, The Lumineers, Buddy Valastro of Cake Boss, Duff Goldman of Ace of Cakes, and more!